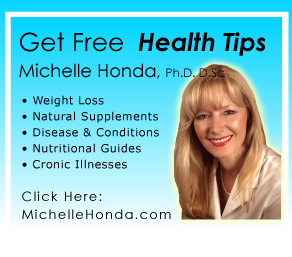 If you are near Hamilton, Stoney Creek or Burlington and are seeking effective solutions to your IBS symptoms, Michelle Honda Holistic Doctor’s program can help you. The following case history exemplifies how possible true healing can be for you. Michelle can Renew You too! A female patient came to see me with the above complaints and more, which have plagued her since 2005. One of her challenges is over working between two jobs, which does not allow for adequate rest so her body can heal itself. Over exerting oneself takes crucial energy away from the immune system and the restoration of the body. Note: Because the patient purchased my book, Reverse Gut Diseases Naturally, she only required 3 appointments to correct all of the above symptoms. Like most people I see, she suffered from malnourishment. The patient has a problem digesting beef, MSG (I informed her of a safe form of MSSG that is in my book), dairy, gluten, corn, soy, and red quinoa. Note: Quinoa is 60% protein and may not be a problem in the future once her gut has had sufficient time to heal. Also another variety may be tolerable which she is going to try. Eating out: Inform friends and relatives that you are on a specific diet and then tell them what you can eat. People want to feed their guests and would much rather know what will not harm you as well as what you would enjoy eating. Restaurants: Call and check that they prepare foods that are 100% safe for you to eat, otherwise choose a different location. Gut disorders are not an isolated condition. Many establishments cater to restricted menus. For initial calming of symptoms of cramping, diarrhea, bloating, I remove any irritating liquids and foods such as coffee, sugar, gluten, all dairy products in this patients case and replaced her dairy with goat’s whey and lactose free whey powder for an extra protein source. *Other irritating liquids such as alcohol and pop were not part of her regime. Supplements were recommended to pick up her immune system; thyroid specifically and the whole of her endocrine system. The supplements did not bother her stomach. I instructed her to go to, “Initial Protocol” in my book for help in this area. Raw Vegetable juice is a great healer and provides easily absorbed nutrients that do not require a fraction of the same energy it takes to digest solid food or juice that retains its fibre content. My recipe is in the book. The patient required the right balance of essential fatty acids. She was very low in this area. The patient’s low blood pressure was due to low hem levels. I picked her blood up with a whole food supplement – not an iron supplement. Her diet now consists of mainly alkaline foods that were initially very easy to digest. The lady’s protein was increased in forms that were easily digested in the beginning. First week: At the end of her first week, the patient’s bowel movements were steadily decreasing. “Still working too much” she agreed to cut down her evening hours until she feels more energized and stronger. At the end of the first week, the patient had one bout of diarrhea after eating a breakfast of almond yogurt, corn and granola. A few sips of coffee, 2 eggs and toast. All at once. Since this took place in the first week, the patient was not fully aware at this time of how careful she needed to be. Her body let her know immediately which gave her the necessary awareness to adhere to her new regime until symptoms subside. From this point in time, her condition turned around rapidly. Her body was now being feed in a manner which it could assimilate and restore itself. The dietary supplements continue to boost and assist her in rebalancing her body, working toward an optimum state of health. The only time the patient ran into a setback was when she went to a restaurant and did not do her due diligence in making sure the food was safe for her to eat. Unfortunately she experienced gas, bloating and increased bowel movements. If you are not local to the clinic, Michelle can conduct telephone appointments with you very easily. So if you are anywhere in North America, you can now successfully receive high end, specialized help for your Crohn’s disease or ulcerative colitis. If you are local to the clinic in Hamilton, Toronto or Mississauga Ontario – by all means come in for your appointment. If not, telephone appointments are very popular and convenient.